Thanksgiving Day football is a tradition in Massachusetts. Each year, throughout the “Bay State,” dozens of high school teams take the field and play the country’s most popular game on the day the nation gives thanks. Except, that is, for the 32 teams that have either canceled or rescheduled their Thanksgiving games due to the predicted cold temperatures on Thanksgiving Day. In total, 32 games scheduled originally for Thursday have been changed to Wednesday, with game times spanning from the mid-afternoon to the late evening. One contest has even been canceled, with both athletic directors of Nipmuc Regional and Blackstone Valley announcing that their Thanksgiving Day game will not take place due to the weather and poor field conditions. Both programs are slated to play in their respective division’s Super Bowl on December 1. Nipmuc will face Scituate in the Division 5 Final while Blackstone Valley battles St. Mary’s in the Division 6 Final. The Twitter backlash led officials to reconsider and put the game back on for Thanksgiving Day at its normal time. With the outcry coming late Monday evening after Mayor Sullivan’s 7:56 p.m. tweet, those displeased with the decision did not have to wait long for a reversal. The Milton High School athletic department issued a tweet at 8:05 a.m. on Tuesday morning that the Thanksgiving game had been moved back to its original time of 10:00 a.m. at Braintree High School. Mayor Sullivan also issued a similar announcement. Sullivan also said warming tents will be set up on the sidelines, and 500 pairs of hand warmers will be available for spectators in the stands. The outcry, however, did not convince most administrators at other schools to follow suit and put their games back on for “Turkey Day.” As of last count, more than thirty games had been moved from Thursday to next week. Temperatures in the greater Boston area are supposed to reach a high of 22 degrees on Thursday. 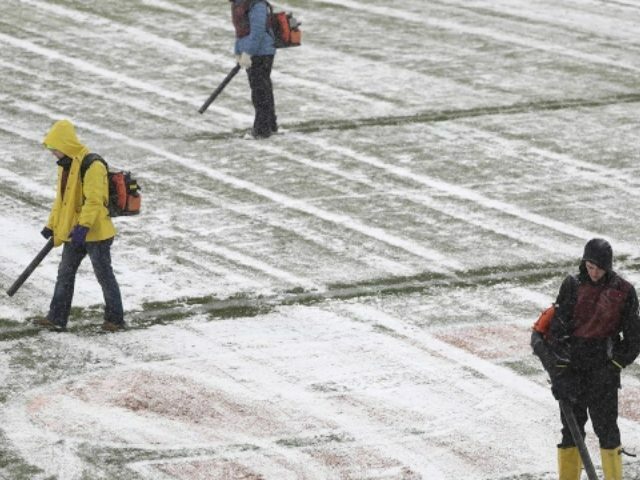 However, as one of the Twitter users said, football players in Massachusetts are used accustomed to playing in conditions even worse than those projected for Thanksgiving Day. Meaning, there was a time when football players in Massachusetts would just fight through harsh, wintry conditions and play the game they loved. Sadly, it appears those days are coming to an end.